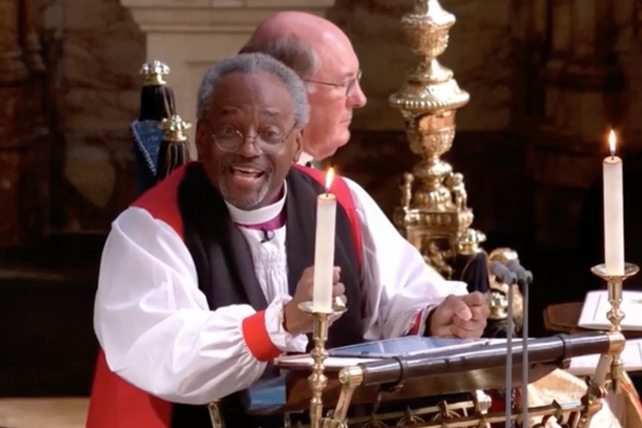 I said on Sunday that I’d say a little bit more about the sermon preached at the Royal Wedding. It was clearly very popular. Ed Milliband tweeted: “Rev Michael Curry could almost make me a believer”. Various headlines said his sermon “stole the show”. He certainly talked lots about “the love of God” in public to an audience of 30 million or so; something we’re not very used to. “Beloved, do not believe every spirit, but test the spirits to see whether they are from God, for many false prophets have gone out into the world”. In that verse, John isn’t describing the false teaching of other religions; he’s describing things said in the name of Christ. John tells us that we can’t believe everything that comes from a pulpit; not everything said in the name of Christianity is true. This verse tells us to test what we hear, at the bar of truth (v.2-3) and the apostle’s teaching (v.6). I want to suggest that what the preacher said was really quite devious (you can read the transcript here). He used a bunch of Christian words to say something that strikes at the heart of the gospel. It was “the spirit or error” talking in the Chapel at Windsor not the “Spirit of truth” (v.6). The tell-tell line was this one: “Oh, there’s power, power in love. Not just in its romantic forms, but any form, any shape of love”. You can be sure that was no throw-away line or slip of the tongue. That was deliberate. And in that line, he gave the game away. His message was about a shape-less, form-less love. It was a squishy love. The love that was preached at Windsor Chapel cannot squeeze or force anybody into a specific course of action. It cannot say “no!”. It was not a love that can call anyone to repentance, or pull them back from hell. Yet, that is precisely what the real love of God does. God’s love has a specific shape and a form. It’s revealed in Jesus Christ. It can be written about in human language. And its specific shape exposes our sinful loves. Sadly what was talked about on Saturday was a counterfeit of God’s love, not the real thing. The point of this post isn’t simply to criticise a sermon that was popular. It’s to encourage you to take 1 John 4:1 seriously. If we’re going to grow in discernment as Christians, we have to listen very carefully when we people talk about the love of God, and ask: “what do they mean?“. If we’re going to share Christ clearly with this world, we’ll have to distinguish the false and true versions people hear. So, if people tell you how much they liked the sermon, I’d encourage you to ask what the person liked about it, and be ready to speak about the love of God that loves us too much to leave us loving the darkness (John 3:16 & 19). Remember, it is never loving to misrepresent the love of God. https://ashenden.org/2018/05/19/michael-curry-the-royal-wedding-a-star-turn-offers-the-world-christianity-lite/ (His comments are mixed with some politics, which can confuse the issue, but the overall analysis is good).